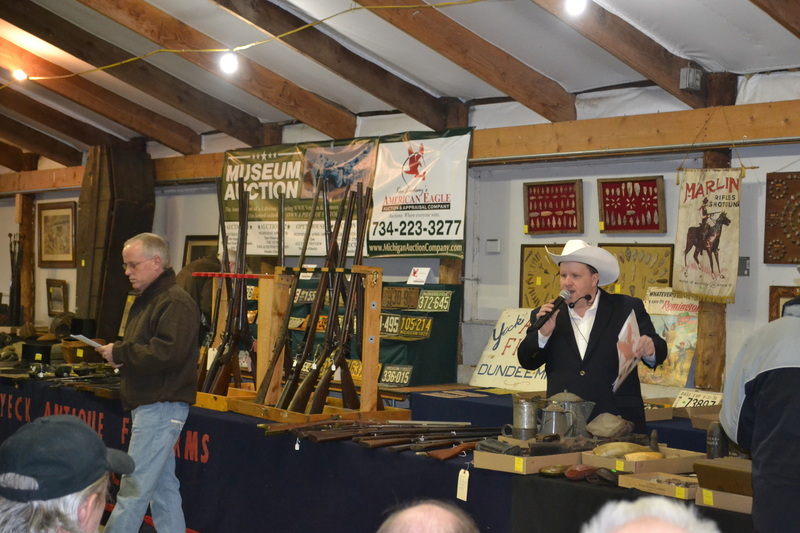 The Super Auction featured the estate of former University of Michigan and NFL great, Ron Kramer and select items from world renowned military collector and museum owner, Mike Yeck. ANN ARBOR, Mich. — At the Super Auction, bidders never need to worry about missing the items they want hitting the auction block. Specific genres are well-advertised and sold within a one-hour time slot. As such, at the most recent Super Auction, coin collectors showed up at 10 a.m. and were on their way out the door at 11 a.m. – unless they were also interested in baseball cards, and then they would have to hang around until 2 p.m. For those interested in military memorabilia, the time slot for this genre was 1 p.m. The ring that garnered the most interest recently was led by Braun & Helmer during the third session. This ring featured many items from the estate of Ron Kramer, who was an outstanding athlete at the University of Michigan and in the NFL. Kramer was a three-sport athlete at East Detroit High School in Eastpointe, Mich. He played both football and basketball at the University of Michigan. Kramer then went on to play in the NFL for 10 years – seven years with the Green Bay Packers and three with the Detroit Lions. Collectors of sports memorabilia were joined by many diehard University of Michigan fans eager to own a piece of Michigan sports history. The highlight of this collection was Kramerrsquo;s game-used, Green Bay Packers helmet. The helmet likely dates from 1964, and it included his jersey number along with autographs from NFL Hall-of-Famers Paul Horning, Bart Starr, Johnny Unitas and other players. Several bidders desired to take this helmet home before a final price of $2,300 was determined. Other items from his Green Bay Packers days include a team-issued wool blanket that sold for $750; a Proline Green Bay Packer helmet with 29 signatures that earned $600; a framed Packersrsquo; jersey that had been signed by Brett Farve earned $325; and Kramerrsquo;s personal Green Bay Packers Hall of Fame plaque – the other is in the Hall of Fame in Green Bay – that crossed the block for $500. From Kramerrsquo;s college career, there was his Michigan varsity jacket with his name embroidered on the inside that sold for $500; a signed All-Star game jersey from a game played in Chicago in 1957 when the College All-Stars played the NFL champion team that sold for $1,750; and an original oil painting of Kramer by Dan Kistler picturing him in his Wolverinesrsquo; uniform accompanied by a pair of game-used pants that crossed the block for $650. From Kramerrsquo;s high school days, playing for the East Detroit Shamrocks, there was a game-used leather helmet that sold for $425. Toy collectors were among those who had to arrive early. Joseph Saine opened his session with an outstanding collection of Schoenhut toys. The piece that would certainly give a child the opportunity to be imaginative was the circus tent. This piece was complete with all original parts and had a lithographed backdrop. The final bid for this piece was $3,250. There were a large number of animals and other pieces to fill it. Among these there was a circus tiger that sold for $140; a lion tamer that saw $120; a ringmaster that crossed the block; and a strong man that sold for $150. Among the many other animals that could be used in the circus setting or just as a toy with which to play there was a hippo with painted eyes that sold for $160; an alligator with glass eyes that saw $170; and an ostrich that sold for $150. Following the Schoenhut animals, Saine presented a large selection of antique toys and banks. Examples of the banks included a cast iron Arcade Yellow Taxi still bank in its original condition from the 1920s that sold for $800; a cast iron Shepard Stump Speaker mechanical bank from the 1880s earned $625; and an original cast iron J.E. Stevens Darktown battery-operated mechanical bank from the 1800s that crossed the block for $1,350. Examples of the toys include a pressed steel Buddy L aerial ladder fire truck that sold for $375; a cast iron Hybley “Lindy” fixed-wing monoplane commanded $575; and, from 1910, a Fleischmann clockwork ocean liner earned a final bid of $600. After the toys, the ring attracted pottery aficionados. These pieces were brought by Belhorn Auctions, a company known for its pottery sales. Standing 7 1/4 inches tall, a Denver Denaura/Lonhuda vase in matte green crossed the block for $460; an 8 inch tall vase marked Catalina Island sold for $230; and an unmarked Arts and Crafts vase, 9 inches tall, in matte green, earned $505. A Rookwood Vellum glaze vase by Sallie Coyne from 1940 in matte green and blue glaze standing 6 1/4 inches tall saw a final bid of $250. Also selling for $250 was a 9 inch Common Ground vase by Eric Olsen. An 8 1/2 inch Common ground vase sold for $290. No pottery auction is complete unless it has Roseville pieces. A Blackberry basket, 8 1/4 inches, sold for $200; a 15 inch Bushberry also earned $200; a 16 1/4 inch Water Lily floor vase crossed the block for $240; and a 10 inch Dahlrose vase sold for $190. There was an influx of jewelry collectors prior to the 11 a.m. session. The reason? Dennis Beals had again brought a vast selection of costume jewelry. All of his jewelry was sold in lots with each lot bringing spirited bidding. Most of the lots sold for $300 to $400 with at least two of the lots topping $900. The other desirable items presented by Beals were large selections of badges from many services including police and fire departments. Bob Robertsrsquo; session offered a variety of items including Star Wars and Coca-Cola collectibles; military and Native American items. Darth Vader storage cases, some with Star Wars action figures, sold from $160 to $340 for filled cases. Luke Skywalker and Darth Vader electronic light sabers sold for $180. The prime lot, however, contained eight action figures with coins. These were made only once a year, and they were not popular when they were first made. This lot sold for $800. A Victory motorcycle engine cutaway, which was made for a dealership display, sold for $450. From the Native American collection, a necklace from the Fox Field Site in Mason County, Ky. sold for $270. Kenny Lindsay brought a large selection of items from the Michael Yeck military museum, which he was in the progress of liquidating. Primarily these were military items collected by Yeck through several years and were from many eras. From the Civil War era, there was a 10 volume set of books, Photographic History of the Civil War sold for $150; and a Civil War bullet board had a final bid of $325. A print of Lincoln by Currier & Ives sold for $225. A silk banner for Marlin rifles and shotguns – stating that they were a “symbol of accuracy since 1870” – sold for $500; and several rifles and guns, many from the Hamilton Rifle Co., Plymouth, Mich., were presented and sold for $225 to $325. A stereoscope and cards from World War I sold for $400; a lot of nine cartridge and cap boxes from the Civil War era earned $350; and a collection of 13 volumes of Michigan infantry, cavalry and sharpshootersrsquo; books was added to someonersquo;s collection of historical items for $550. The car collector was not forgotten as there were two cars available. One was a restored 1950 Chevrolet two-door coupe that sold for $6,500; and the other a 1979 Pontiac Firebird Trans Am that earned a final bid of $4,500. 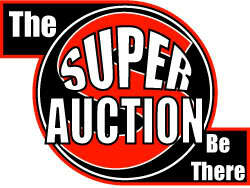 Watch for the next Super Auction later this year; items to be sold at each specific time will be published to help bidders play their day. All prices quoted are the hammer price and do not include the buyers premium.